Top o' the morning film fans! 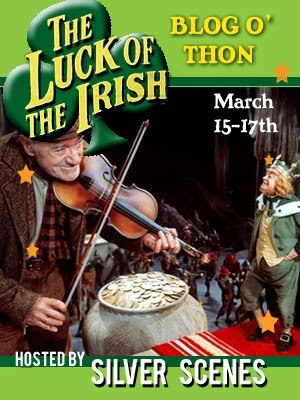 Silver Scenes is proud to present The Luck of the Irish Blog o'thon...a wee little event to celebrate the joy and talent that the Irish have brought to the silver screen for many many years. THE DETAILS: We not be specific - you can write about almost anything so long as it has a bit o' Irish in it, was filmed prior to 1975, and features no blessed word spoken against the little people. Will you be wanting to write about an Irish-made production? That'll be grand! Will ye be caring to write about an Irish-born actor? We tip our hats to ye! Movies that take place in Ireland are surely welcome and you most certainly can write about an American actor with an Irish heritage. We not be turning down any post on Cagney himself. And do not be forgetting the talented Irish men and women who worked behind the magic movie screen as well. DATE: The Luck of the Irish Blog o'thon runs from March 15th through St. Paddy's Day itself. Ready to join in the jig? Just click here to be taken to Silver Scenes and add your name, blog site, and the topic you be wanting to write about in the comment box on our site. Thankee for reading this announcement and we hope to see you at the ceilildh!